The Igloo Dome Sensory Deprivation Pillow is a product that can block out virtually all light and sound to help you have a better night sleep. This product is perfect for people who tend to be light sleepers and can be awoken by light or sound. In addition, if you have a difficult time going to sleep because of light or sound, this product will block it out and make your sleep deeper and easier. 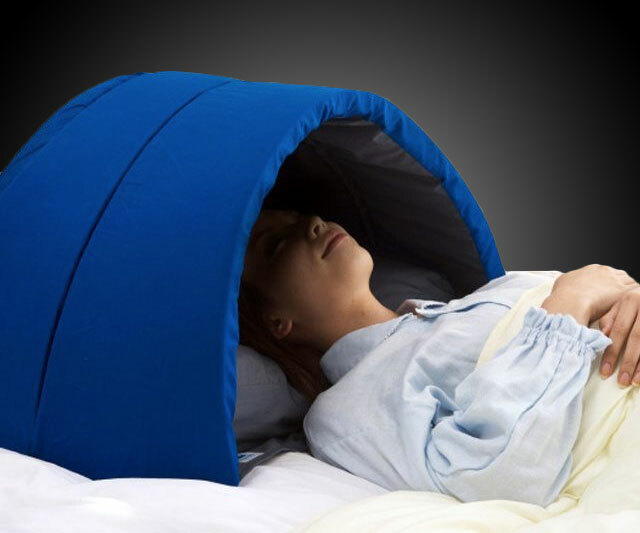 The great thing about the Igloo Dome Sensory Deprivation Pillow is that you can do all of this without strapping an eye mask over you eyes or putting in earplugs. You also do not have to look like an ostrich. You simply place your head in the opening of the pillow and have a restful night of sleep. It is a cushioned sleeping tent. It is designed for your head and can block out almost all light and sound. It is perfect for sleeping at night, in the middle of the day, or any other time. The Igloo Dome Sensory Deprivation Pillow works so well because it is sewn together with special materials made of urethane. These materials absorb the sound and banish the light from the room. It is versatile and can be used in your bed as a pillow, on a desk, on a sofa, or any other place you may want to rest your head. It is beneficial for camping because it can block out all the sounds of nature. Even if there is an annoying show on television that your significant other will not turn off for your sleep, you can now do it anyway. It can be folded and collapsed for easy storage. The dome size is 28.3″ x 21.7″ x 14.2″. It impressively blocks out 99.9% of light and has a sound absorption ratio of 126%.